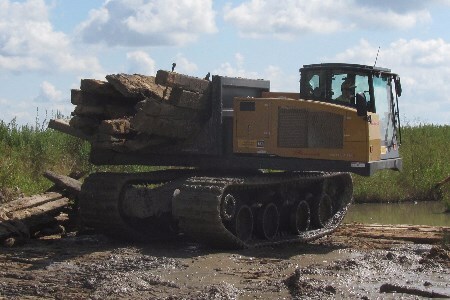 PipeLine Machinery International has announced the newest custom equipment solution to the pipeline industry: PANTHER T14R and PANTHER T16 by PRINOTH. Offering the highest speed combined with the highest payload in its class, the PANTHER T14R and PANTHER T16 carriers set new standards in productivity and mobility. The PANTHER T14R rotating carrier will allow the continuous rotation of the upper portion of the vehicle independent from the undercarriage. The patent-pending direction reset allows the operator to reset the vehicle’s upper and lower portions’ alignment (front to back) by simply pushing a button. The PANTHER T14R has a 29 100 lb (13 200 kg) payload capacity and a loaded ground pressure of 7.46 psi. Together with a superior speed of 8.1 mph (13 km/hr) and its narrower width of less than 102 in., the PANTHER T14R provides a solution to working in tight, challenging areas where other vehicles do not have access. The PANTHER T16 carrier has the highest payload in its class at 33 500 lb (15 195 kg) and a ground pressure of 6.87 psi, fully loaded. Available in the tilting flat bed or dumper configurations, the PANTHER T16 was designed for the rubber track option to provide a sturdy undercarriage composed of five large wheels with both a tandem and a tridem suspension. This creates a uniform distribution of the load over the rubber track while offering superior suspension. With a maximum speed of 8 mph (13 km/hr), the PANTHER T16 is sure to increase productivity, regardless of the project. All PANTHER models by PRINOTH are powered by Cat® ACERT™ engines. This gives you the reliability that the Cat engine provides, as well as exceptional service through the Cat dealer network. Additional standard features include a ROPS/FOPS certified cab designed for operator safety and comfort and a steering wheel and pedal combination for easier and more controlled operation of the vehicle in tough terrain. The steering column is telescopic and tilt able. Pavement-friendly rubber tracks and remarkable speed make the PANTHER carriers highly mobile. A unique zig-zag patterned track design increases off-road mobility, providing outstanding traction and side-hill grip. All PANTHER models are equipped with an auto-brake feature, providing optimal safety in all working environments. Offering exceptional performance and versatility for the pipeline industry, the PANTHER T14R and PANTHER T16 have the toughness, tenacity and reliability needed in a carrier.